Today, Tesla reduced the entry price for its all-electric SUV, the Model X, by $9,000 with a new option for a 75 kWh battery pack software-limited to 60 kWh. The news follows the introduction of the same concept in the Model S lineup last month when Tesla announced the Model S 60 starting at $66,000. As for the Model X, the base version still retains its dual motor platform and therefore, it will have a Model X 60D badge. Owners will have the option to unlock the remaining 15 kWh of energy capacity in the battery pack after the purchase for a $9,000 fee or order the vehicle as a Model X 75D for $83,000, as it was the case before today. 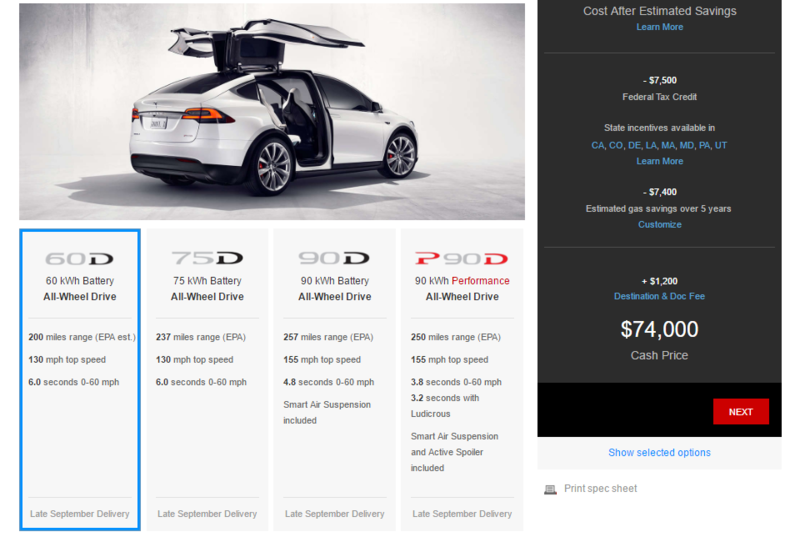 For the $9,000 price drop, you lose 37 miles of range off the Model X 75’s 237 miles for a total of 200 miles of range on a single charge for the new Model X 60D. The new variant has the same performance as the 75D version with a 0 to 60 mph acceleration in 6 seconds and a top speed of 130 mph. We’ve just introduced a new option for Model X on our website – Model X 60D. Model X is the safest, quickest and most capable sport utility vehicle in history, and existing Model X owners are loving their cars. Following on the success of Model S 60 and 60D and in order to bring the benefits of Tesla ownership to even more people, today we’re introducing Model X 60D at a starting price of $74,000 – giving customers the flexibility to choose the Tesla model, price point and range that best fits their lifestyle. Our versatile product platform and efficient manufacturing processes make it possible to seamlessly extend these types of compelling offerings to customers. The new Model X 60D delivers up to 200 miles of range (EPA est. ), a top speed of 130 mph, zero-to-60 acceleration in 6.0 seconds, and all-wheel drive performance, starting at $74,000. Customers can check out Model X at select tour stops across the US this summer.